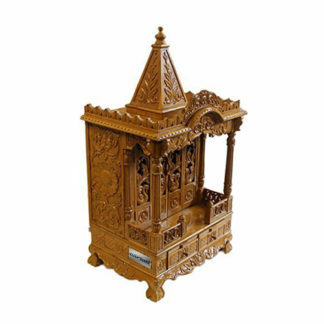 Aarsun Woods present a handmade Wooden temple / Mandir / Pooja Ghar suitable for homes /offices and restaurant. The Temple wall mounted pooja mandir is made from Sheesham Wood with traditional carving and fine finishing. The Wooden temple / pooja mandir is mounted on round circular pies and single drawer at the front with brass knob for placing some pooja essentials. The wooden temple consists of a Garbgriha, main place for the deity where you can place your idols.The back portion of the wooden temple has a jaali pattern and carved pillars at the front. The temple at the top roof area has a single gopuram-style dome along with its finials and shikhara at the top. The Wooden Temple is made carefully keeping the sentiments and clients’ requirements. The wooden mandir / temple is in Sheesham Wood except for the base where idols are to be placed and the top which is made in premium plywood. These Indian Wooden temple/ puja mandir are used and appreciated for idols adding a spiritual touch to your place. They are very unique and considered best in Sheesham Wood. The wall mounted pooja mandir is made from Rosewood is famous for its long lasting strength and have its own spiritual significance. We provide a wide range of designs in Wooden Temples that can be customized as per customer requirement. Contact us for a different Size. The Wooden temple is made from Indian rosewood except used plywood at the back, ceiling and the base of the Temple. Sheesham Wood temple is famous for long lasting durability. The temple has been crafted beautifully. Initially I received a little damaged part (probably damage happened in transit) but the owners of Aarsun Woods replaced it very humbly. #Respect for such professionalism and quality. The article has been received within the stipulated date. I am very much satisfied with the item. I will convey this to my friends to purchase this item, if it is needed by them. Thank you. Neat carving & timely delivery.